Quite a common figure this one. 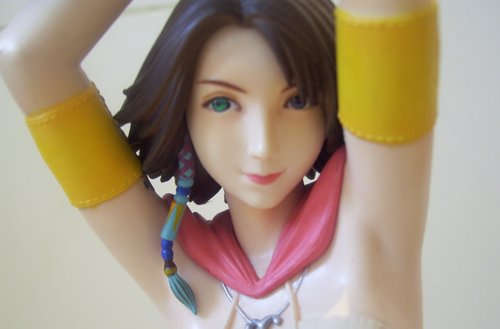 I’m sure any fan of the final fantasy figurines has come across this one many times before. This was actually the first ever figure I bought! It was many years ago, and at the time the figure was actually quite expensive but these days it only keeps falling in price. As it is quite a cheap figures, most people believe it to be of low quality, but I am here to speak the truth!! 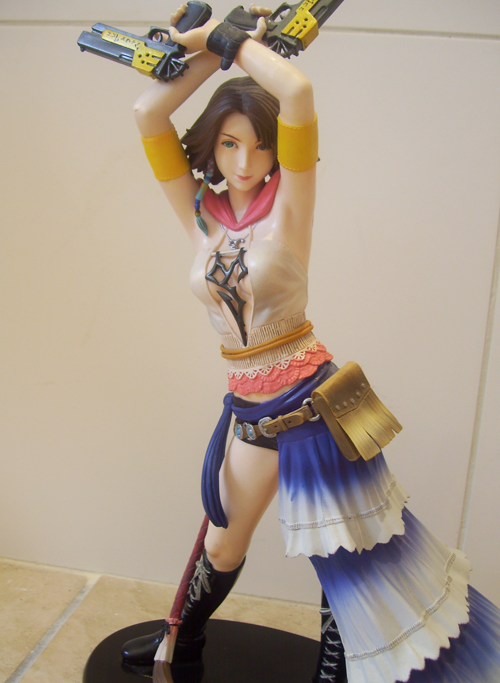 Here is the full picture of my Yuna figure. As you can see she is almost exactly like the prototype picture that is shown by most sellers and stores. Her pose flows quite well and looks very natural. As far as her side-skirt goes I feel the colouring is a little too dark as in-game it is a much lighter blue. Her top is probably the best part of the figure as it provided great detail in the pink lace and has a very realistic feel with the provided creases fitting the pose. Her guns are also very high in detail and I was very impressed with them. Well . . as you can see the close up of her face is nothing to shout about. This to me is where the figure has let me down a bit, she virtually has no facial expression at all unfortunately. The eyes have almost no detail and look very bland, the lips also seem to look too thin in my opinion. 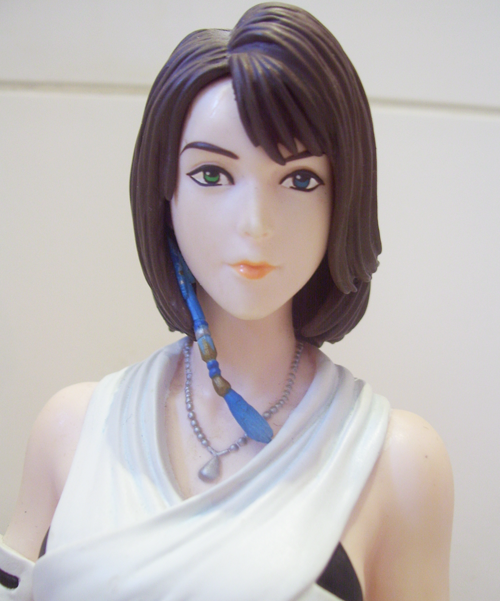 On the positive side I feel the structure of the face and the placement of its features match Yuna to a T. Another thing I admire is the lovely detail put onto her small earring, though apart from those points I can’t say I’m too happy about the face. 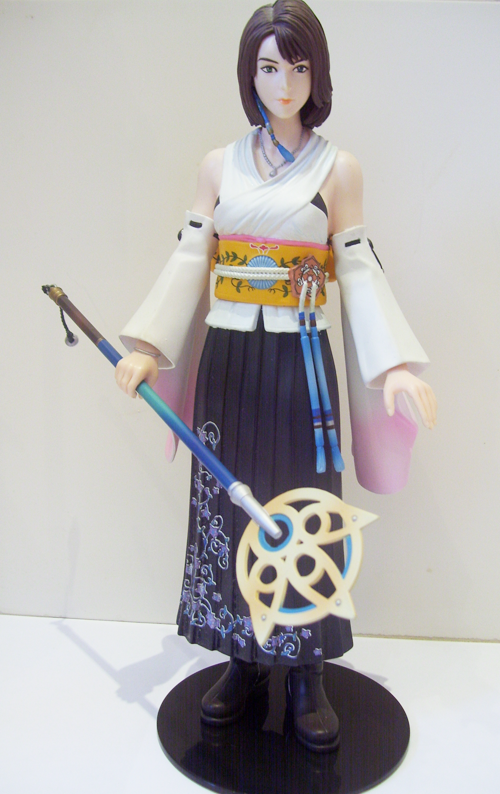 If your a big fan of Yuna don’t let the cheap price put you off in this case, your getting a really good price for a really beautiful figure. Click here to buy Yuna at Play-Asia. 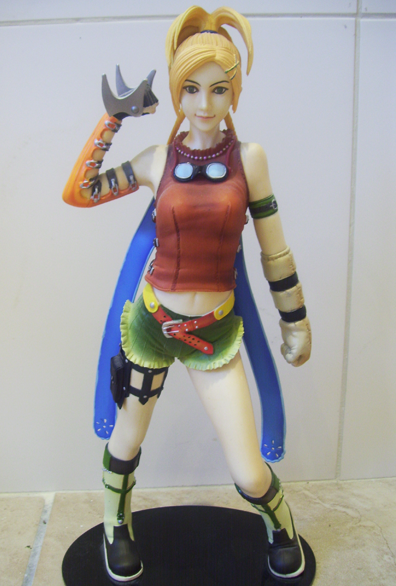 So, here is a full picture of my lovely Rikku. With being 1/6 scale, she is very large and quite sturdy. I really love the pose and colouring of this figure, they match the character in-game perfectly! 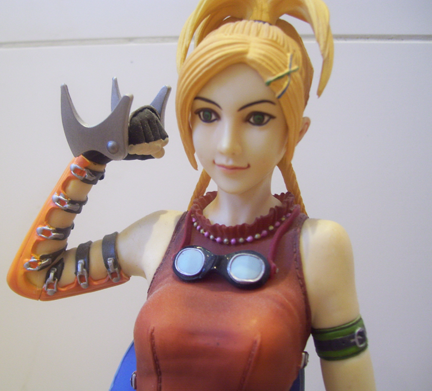 This is for sure the best figurine out there that best represents Rikku. There is no assembly required apart from putting her onto the stand. The stand fits perfectly so I can’t complain about that problem this time around. The colours and painting is very accurate from top to bottom. What I love most about this figure is the amazing detailing and perfection of her face. Yes her facial expression itself doesn’t say much, its just a cutesy smile, but the detail is just beautiful. Even the swirls inside Rikkus eyes are detectable. Yes I know the pricing of this figure is quite steep, but you really are getting what you pay for in this case! I’ve had this figure for maybe..4 years now? And she is still holding out strong, I have also managed to keep the box and packaging in 100% perfect condition so that one day I can sell her on. If your a big fan and just want the figure to display, then go to e bay and bid on one that is maybe not 100% perfect but still in good condition, this means the price will be much more reasonable.